Yup more of my photo's. Abandoned places and things fascinate me. They all have stories to tell. Once they were someones pride and joy, once they were new, once they were alive. Now they are just artifacts. A photo of a photo. 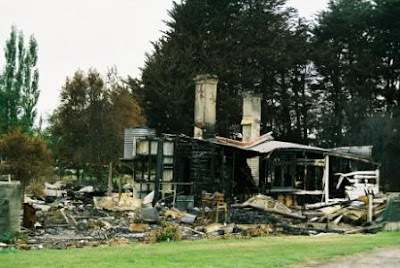 West of Palmy, I have been watching this place slowly collapse for years now. Somewhere south of Te Kuiti. Somewhere between Dunedin and Gore. This cut down Triumph has been parked in a field south of Napier for about a decade. It has been home-converted into a ute; they never came out of the factory looking like that. Someone had a lot of fun with it I suspect. 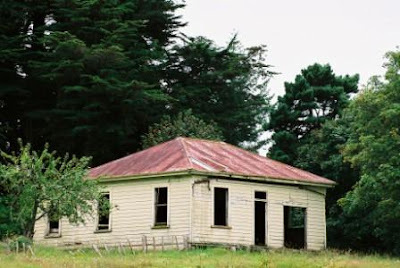 When I was a kid we'd hang out round this dilapidated building we called The Woolshed (off Allington Rd, Karori, near the pedestrian shortcut). It may have been a woolshed once. It had a floor and walls and a roof, just not in the same places. ps: Back to Basics! Yeah! Oh well, to try adding some comment, some of my favourite songs to sing and play on the guitar are 'The Myth of Trust' and 'This Guitar Says Sorry', but I've been playing them now for 19 years and they're very customised. There's an old story about a newly wed wife who's husband left her for the war and died over there. Apparently the wife was so distraught she killed herself in her house and has since stayed there and haunted it ever since. 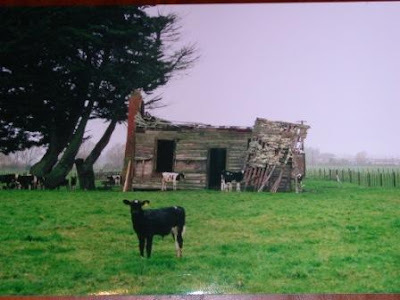 That house is your picture located south of Napier. Always fascinated me that place. Not sure if the story is true or not though - but fascinating none the less. St Swithins day always makes me come over all wistful. It is good honest music. Barwench its an interesting tale you have there. I like how folklore attaches itself to things like this.